I really enjoyed MIDNIGHT BITES. It's been a while since this series closed, so reading this book was almost like returning home to some of my favorite characters. There's a good mix of new content in between the previously released stories. I hadn't read any of the previously released parts, so this anthology was entirely new content for me, making me enjoy it even more. There's a great mix of stories in this anthology, from things that last a few pages, to ones that are a bit longer that let you get more immersed. A lot of times in anthologies I do get frustrated with the brevity of the stories, but that wasn't the case here. Despite there being so many different short stories packed into this book, I didn't get frustrated with that lack of depth. I think it had a lot to do with how the entire thing was set up chronologically, making it all flow well, and tie in together. Some of the stories themselves hinted at things that were then tied back to in later stories, so it was really enjoyable. There's a good mix of perspectives, something for every character fan. 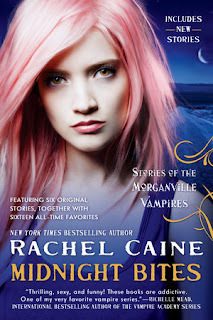 There's one downside to this enjoyable anthology and that's that it has left wanting more from Morganville again. I had said my bittersweet goodbyes at the release of the final book, and I feel like this book has only reopened things back up. I want, would almost say need, more from this world. There's so much room and potential for more and considering just how many books and stories have been released in this world, that's saying something. That being said, despite wanting more, MIDNIGHT BITES is a very satisfying absolute must read for Morganville fans. As they say, you never really leave Morganville, and that's only been proven here with this fantastic anthology. Here's to hoping Rachel Caine returns again and again to this world in the future.